If you’ve read my previous posts Non-Alcoholic Options in Pubs and Non-Alcoholic Options in Pubs – Update 1 you’ll know that I’ve been tracking down some alcohol free options recently. Whilst those two posts dealt with pubs, this post focusses on what I’ve found are the alcohol free choices in my local supermarkets. Near where I live, the best options appear to be in Morrisons supermarket – handy in that it’s the closest. Sainsbury’s on my first visit had nothing but it seems that the situation is improving – with at least two options available at the moment. There is no Tesco near where I live at the moment (and no thanks Tesco – we don’t need one) so I haven’t done any research there, but I do hear that they stock Bernard Free which I recently enjoyed at the Euston Tap in London. The most common option in pubs is also available here in 6 bottle cartons. I commented on the excellent flavour in both of the previous posts. Another good one with a real beery taste and no odd flavour. Available in bottles or cans. This one is made in Holland despite its name. An excellent alcohol free wheat beer. Available in Morrisons in cans. This alcohol free beer is produced alongside the normal alcoholic Indian-style Cobra. The similarity between the two versions is striking and I have enjoyed this beer on it’s own as well as with a spicy meal. Currently my favourite of the alcohol free beers although the one time I had 3 bottles in one evening I did experience a hangover-style headache the following day. So who knows what’s in it – it certainly isn’t like the other more european flavoured ones. Haven’t tried this one yet. I suppose I should but everyone seems to slag it off. Available in cans. Obviously prices in supermarkets change over time so this snapshot of prices from Woking Morrisons on 28th November 2010 is really just a guide. Just Becks Blue and Cobra Zero available here. The Cobra Zero was cheaper than Morrisons last time I looked. Both these local small shops had just Becks Blue – significantly more expensive than the majors. I have just ordered and received a couple of mixed cases from the Alcohol Free Shop – a site I stumbled across when searching for details of the other beers I’ve mentioned. They carry an extensive selection of alcohol free and low alcohol drinks of all sorts and the prices are not bad if you order a quantity. I chose two mixed cases of beer as they have an extensive selection including many I’d never seen before. I’ve just started working through them and I’ll post on my experience soon. Veering completely away from beer I have also been experimenting with other drinks. Previously I’ve never been a fan of squashes – I guess I’ve always felt they were for children. But my wife used her initiative and raided the supermarket shelves for something a bit different. 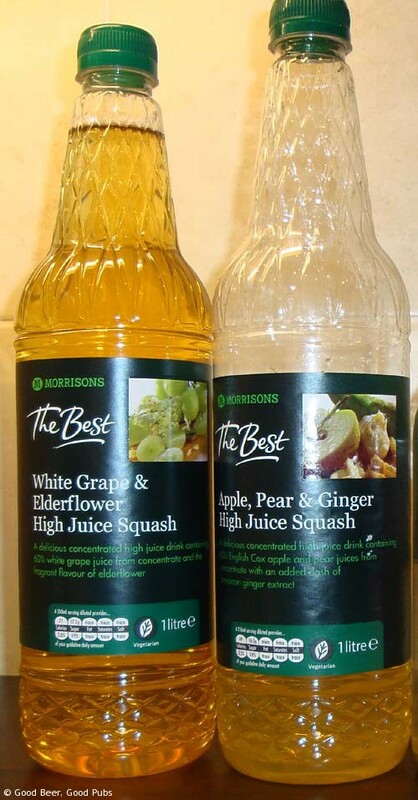 Once again Morrisons have the better selection and my two favourites are now the ‘White Grape & Elderflower’ and ‘Apple, Pear & Ginger’ – both from their ‘The Best…’ range. 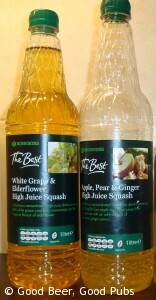 Sainsbury’s carry a ‘Rhubarb and Ginger’ in their ‘Tast the difference ‘ range which is not bad either. Combine any of these with some cheap sparkling water and you have a tasty pint that’s not pretending to be something else. I sometimes spice these up a bit more with some Wrights Original Dark Ginger – a strong ginger cordial I picked up at Ripley Farmers Market. If you’ve got any other ideas for good alcohol free beverages for someone who like a beer then I’d be glad to hear them. Why not leave a comment below. As an ex-pat Brit living in California and currently on a non-drinking kick I was interested in your posts on pubs and supermarkets as I will be visiting the UK shortly. In Los Angeles, we are fairly blessed with a reasonable selection of NA beers, mostly European. To name a few that are readily available in supermarkets and speciality booze outlets, there is Becks (not Blue though), Erdinger, Warsteiner, Clausthaler, Bitburger Drive, Paulaner and St. Pauli, all from Germany, Buckler from Holland, Kaliber courtesy of Guinness, and at least two home brewed varieties, O’Douls and Old Milwaukee. I was interested in your remarks about Kaliber being “slagged” as it has quite a good reputation over here. Perhaps it’s that the American taste is different or perhaps it’s the Guinness cache. Could even be a different tasting brew for each side of the pond, who knows. As for pubs, practically every bar carries O’Douls, which I think is the most insipid N.A. beer on the market, with its rather sweet taste (mind you, most American “lagers,” particularly Budweiser, have a sweet taste. Americans don’t seem to like sharp tastes to their beer). Restaurants by and large offer the European NA beers, particularly Becks, Buckler and Bitburger. A few also carry Kaliber. On the downside, the thing about pubs and restaurants over here is that they generally only carry one NA beer, rather than a selection. Come the revolution I’d like to see more choices. Thanks for your comments Mike. Since I wrote the post I have tried Kaliber in a bar near where I live and actually it’s quite good – so I’ve revised my opinion. My old view came from when it first appeared many years ago and it was truly awful. I think many people’s views on Kaliber spring from then too. I’m glad (not in a schadenfreude way) to find that i’m not the only one to suffer hangovers from the Cobra free stuff (how I found your post). Hopefully, you’ll get some Erdinger Weiss-bier in the mixed case, which is about as close to beer I’ve tasted being a real ale fiend. I’m hoping to try out one of their mixed cases soon, the bock stout looks appealing. Another option is Kopperberg alcohol free – tastes like pear drops and for those with a sweet tooth only! All that said – I’ll be so glad to drink a real pint once more! In Marks and Spencers they do a really lovely sparkling wine called Chapel Hill. Thanks for that Emma. It’s good to know that there is some alcohol free wine that is worth drinking. I used to buy Bernard L/A beer from Tesco. They stopped selling it. Where can I find it now without having to buy a whole case on line. Hi Eric, round where I live Morrisons stock it most of the time. Is there a Morrisons near Barry or Cardiff? The Alcohol Free Shop carries it as well – along with a wide selection of other brands. I’m currently enjoying some bottles of the new non-alcoholic ale one from St Peters Brewery – it’s called St Peters Without. The Alcohol Free shop are based in Manchester but they do mail order: http://www.alcoholfree.co.uk/.